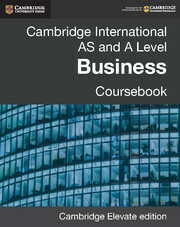 This revised set of resources for Cambridge International AS and A Level Business syllabus (9609) is thoroughly updated for the latest version of the curriculum. Written by experienced authors, this Cambridge Elevate edition provides comprehensive coverage of the syllabus. Accessible language combined with the clear layout makes this an ideal digital resource for the course. Questions and explanation of key terms reinforce knowledge; different kinds of activities build application, analytical and evaluation skills; and case studies contextualise the content making it relevant to international learners. It provides thorough examination support for all papers with exam-style questions with each chapter and an extensive exam-style case study with each unit. 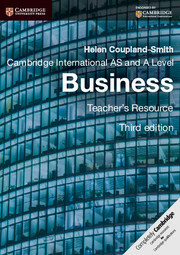 A teacher's CD-ROM is also available with answers to the coursebook questions. 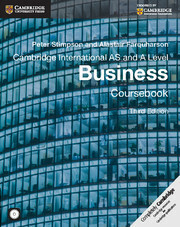 Additional, up-to-date, international case studies to help students apply their knowledge to real-life business scenarios. Exam-style questions allow students to prepare thoroughly for their examinations. 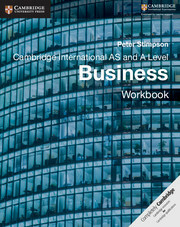 Accompanying documents containing advice on revision and additional activities are available for download throughout the text. Accessible language written with international learners in mind. Unit 3. Marketing: 16. What is marketing?